Just like last year, the fine folks over at Thrasher Magazine and Converse asked us to curate a day show during their Death Match series. To which we replied, 'why the hell not?' This year we put the punk bands outside and their darker contemporaries indoors-—including Soft Moon's only SxSW appearance. All set to perform while some of your favorite skaters try to avoid a faceplant on the half-pipe. Needless to say, it's 100% free and open to everyone. This is our only day show. Impose will host four night shows while in Austin at the Longbranch Inn. You can sign up for the lineup info by RSVPing here. Oh yeah, and we're 10 years old. 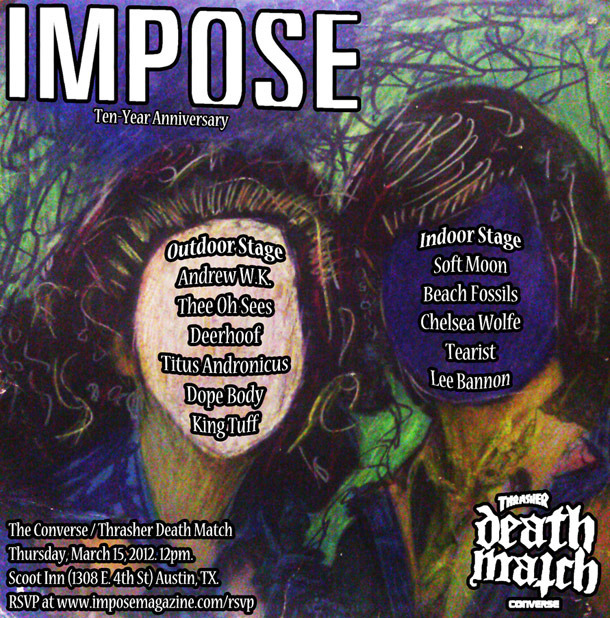 See the full list of bands playing the Thrasher/Converse Death Match here.